It’s understandable that your home has a lot of projects and services in need of getting done, but don’t allow the well-being of your garage door opener to fall by the wayside. It’s not only frustrating to deal with a door that makes a lot of noise and shakes a lot when moving, but it’s taking a toll on the parts and making them worse over time. Rather than need to get even more repair work done in the future, it’s best to have it all taken care of now by our experts. Thanks to daily wear and tear, along with perhaps some rusting, it’s not surprising that your opener’s parts may need some tending to every now and then. Our professionals will check the opener along with its related components like the remote control and wall panel to determine exactly what the problem is so we can get it fixed. Our years of experience mean we’ve seen it all before! So, whether it’s a circuit board that needs replacing, or the motor just needs repairs, we can help. Should the problem be too much, or you decide you’d like to upgrade to something sturdier or quieter, we can replace the whole opener for you as well. Need Your New Opener Installed? No problem! Our team is knowledgeable with all of the most popular brands like Craftsman and Genie so we’ll be able to help you find the best possible opener for your home’s needs. Letting the professionals assemble and install your opener means that you can rest assured it was done correctly and will be working without issue for years to come. If you’ve already bought your new opener, don’t worry! We’d still be glad to put it in for you before you know it. Why put it off when you can just give Garage Door Repair Matthews a call and get your appointment scheduled? You can also send us a message or easily schedule your service online! Not every garage door opener is perfect for every door, and new models are released often enough that it’s hard to say how long any answer would even remain true. As of the time of writing, the best opener according to multiple independent polls was the Chamberlain WD832KEV belt drive model, or the Genie 1035-V chain drive opener as a cheaper alternative. However, don’t forget that each garage door is different, and the best for most people may not be the best for you. 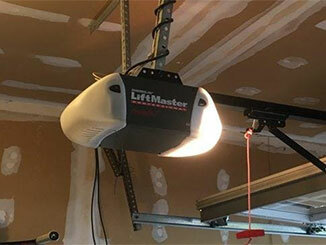 A garage door opener’s lifespan depends both on its innate quality, and its work environment. Opener models whose mechanisms are maintained regularly and who are hooked up to doors substantially lighter than their maximum lifting power will last much longer. The best openers can last over 20 years if treated properly and not overworked, but the average lifespan is closer to 10-15. First, make sure that there’s no button that’s stuck, and check the battery compartment for obstructions before putting in new batteries. If it still doesn’t work, then the problem is either with the remote’s wiring, or the opener’s programming or reception hardware. In the former case, you’re best off getting a new remote. In the latter, professional repairs may be necessary. Make sure that the opener is plugged in, its lights are on, and that its belt, chain, or arm is properly connected to the rest of the door system. Check the travel and force dials, and make sure they haven’t moved since you had the opener set up. Look for broken or exposed wires, and test different control systems (remote, wall panel, car transponder, etc) to see if one of them is the problem. If all else fails, call for help.